Ghana is an anglophone Western African country. It boasts a population of about 27 million and is the ninth largest economy in Africa. Ghana is rich in culture and the unique way in which they prepare their food is what makes them stand out. When it comes to African delicacies, you will almost always find Ghanaian dishes right at the top of the food chain. Traditional Ghanaian cuisine may resemble what you will likely find in most other parts of the African continent, but you will bet rightly that every other thing about it is entirely different. For example, there is the Senegal jollof rice, Nigerian jollof rice, and Ghanaian jollof rice. The debate on which is better is still on, and it will continue. Waakye (pronounced wa-chayy) is a unique Ghanaian dish of rice and beans. It is usually a street-side food that can be eaten for breakfast or brunch. It can be eaten with shito (Ghanaian pepper sauce/salsa) or with vegetables. Banku is a meal prepared by fermenting corn flour, it is just like fufu and can be eaten with stews/soups. 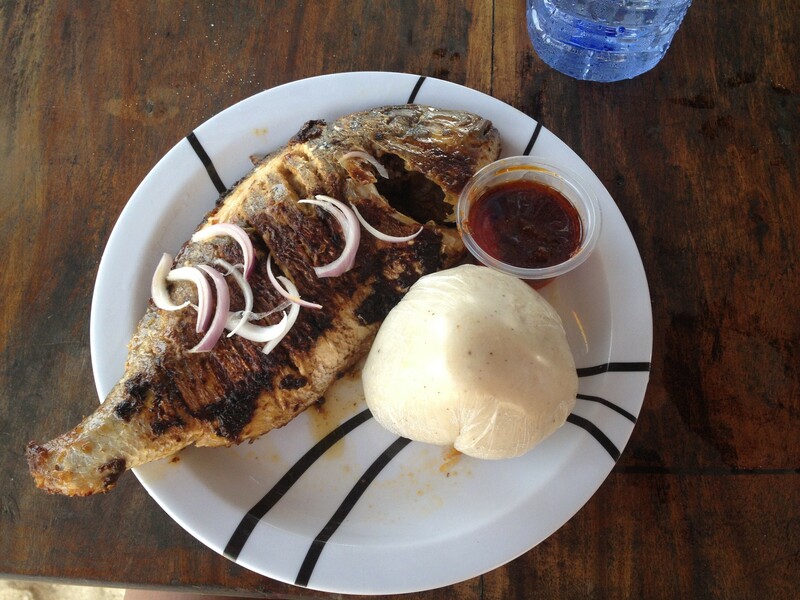 Tilapia is a freshwater fish that is very popular in Ghana. The fish is usually grilled. Both are served with Shito on the side. One of the best things about this dish is that it is considered as a very healthy food. It aids in weight loss, boosting metabolism, improving the immune system, and aiding skin and hair skin. 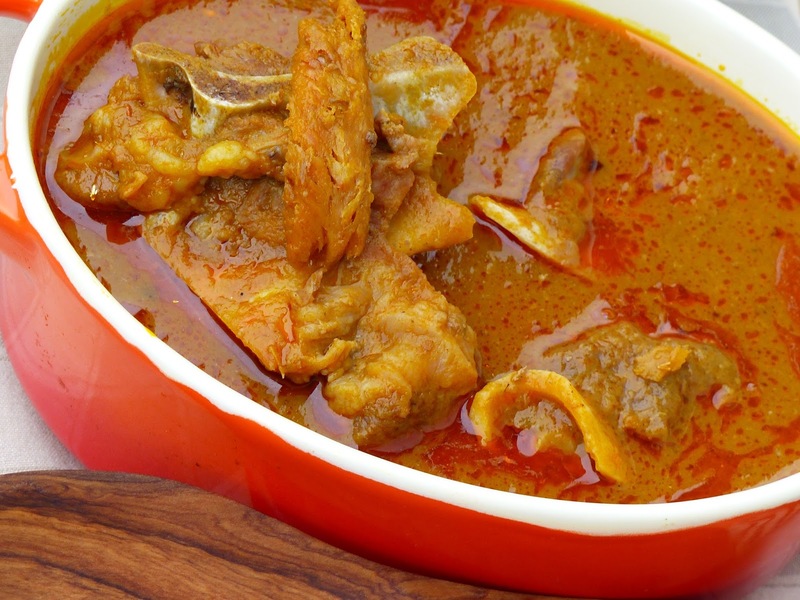 Palm nut soup is a rich soup made from fresh palm nuts that is loved not just in Ghana but West Africa, Nigerians have a version they call Banga soup. The nuts are boiled, pounded to extract the juice from the nut’s meat. The process is no doubt daunting but the result is a full tummy and satisfaction. Palm nut soup can be eaten with Omutuo (riceballs) or Kokonte. With this soup, one can take different things including starch and rice. The ingredients needed for this Ghanaian dish are peeled groundnuts, fish, beef, palm oil, seasoning, vegetable, and grounded crayfish. Red Red has to be one of the best Ghanaian dishes hands down. It’s a beans stew made with black-eyed peas, palm oil, and seasonings to taste. The best accompaniment for this delicacy is fried plantain. Yum! Preparing this dish is surprisingly very easy as you need to just fry the plantain and make the beans almost as regular as you would. It is the combination of the two that makes it great. 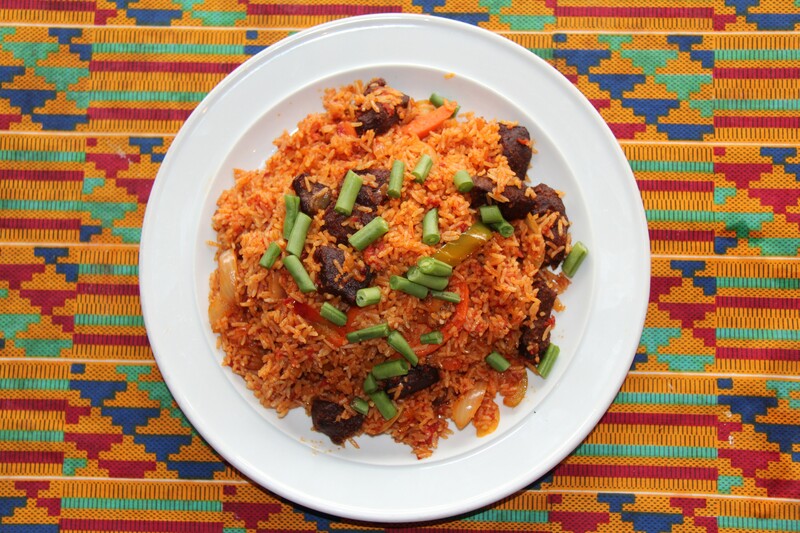 As earlier stated, Jollof rice is another West African favorite. The delicious rice dish can be cooked plain or with mixed vegetables. Jollof is an experience, its awesomeness cannot be explained with words. Ghanaian jollof rice is specially made with the following, red or olive oil, herbs, onions, tomatoes, garlic, ginger, seasoning, salt, and meat. Others include other ingredients in it. Palaver is a Portuguese word which means a long lengthy argument/talk. It has increasingly become a West African slang. Palava sauce can be roughly translated ‘problem sauce’. It’s a sauce made with a combination of meats, fish, leafy vegetables, and crushed bitter melon (agoushie) seeds. Palava sauce sure does wonders for the taste buds. The recipe for this dish is tomatoes, onions, garlic, ginger, seasoning, vegetable oil, smoked fish, and egusi powder. This Ghanaian dish is a personal favourite. The stew is made from the eggplant. The pulp gotten from it is cooked, seasoned and can be garnished with boiled egg, fish, chicken, you name it. The stew is popularly eaten with boiled plantain or boiled yam. Eat this with your favourite sauce accompaniment and you would agree that it is in fact eggcellent! Garden egg stew is mostly used with yam. It is made with garden eggs, tomatoes, pepper, onion, salt and seasoning, vegetable oil, fresh tuna, green pepper, and carrots.